“You know, this is all your fault,” I announce to my husband while standing in line at the Crocs store. His arms are full of wiggly kids trying to knock down rows of colorful displays while I balance the rubber shoes that will serve as proper pool and beach footwear this summer in my arms. Rather than respond, he simply raises one eyebrow at me. It’s as if he already knows what I will say. He rolls his eyes at me and catches my daughter’s quick hand before she swats down an orange sandal display. He’s used to her quick and destructive moves just like he’s used to my emotional musings over our babies not quite being babies anymore. The thing about kids is that no matter how nicely we ask, even with sprinkles and gummy bears on top, they just keep growing, and emotional nutcases, raises hand slowly, like myself, are left wondering how to embrace the inevitable. Today the onset of this emotional roller coaster was all because of Batman and a whale. My little man has always had an eye for sea creatures. For years it’s been shirts with sharks, books about turtles, fish coloring books, whale stuffed animal, jelly fish puzzles. If there was a sea creature on it, we probably own it. 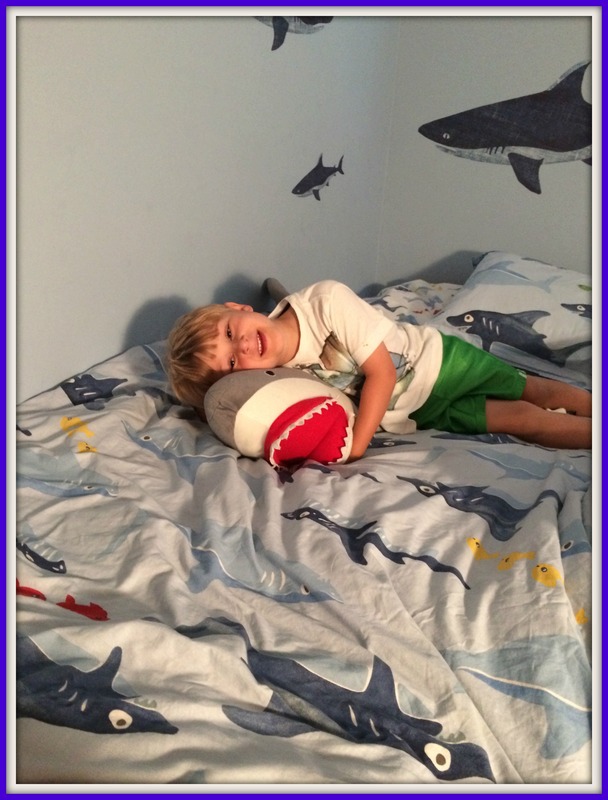 When we decorated his “big boy room” it had to be sharks. Lots and lots of sharks. 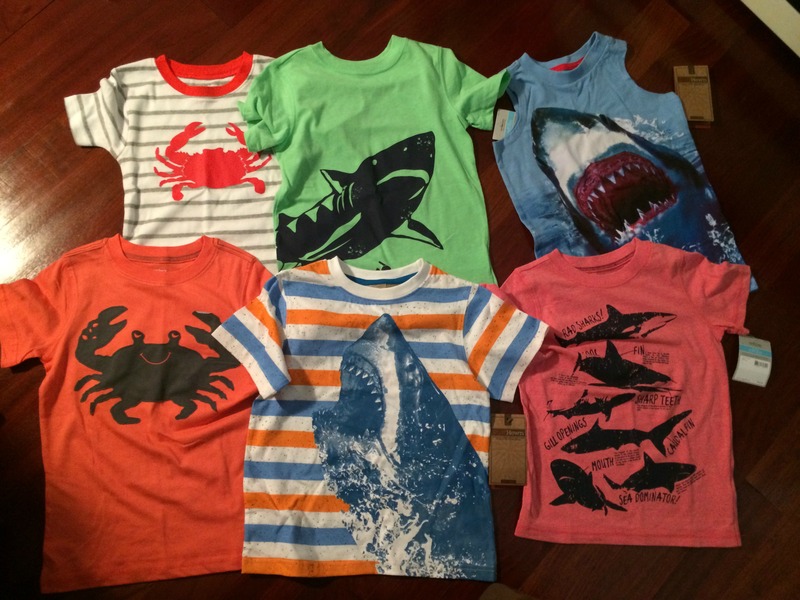 When my mom went on a minishopping spree for the kids, his only request: sea creature shirts. Batman and a whale. What a perfect metaphor for where he is right now. Not a baby but not quite a big kid. Teetering on the thing big kids like and the thing he’s loved since he was a baby. Batman and a whale. He’s a mixture of Super Hero “shooting” webs at his sister and leaping tall buildings in a single bound, and a tiny oceanographer that rattles off facts about orcas and has a plastic puffer fish in his pocket. As the youngest on his t-ball team, the times when I see that he is four and the others six is usually when they are on the bench waiting for their turn up to bat. The older boys sing taunting songs and yell “FOUL” when a batter hits a little short. While my guy just seems thrilled to be outside in the sunshine and sitting on the bench with older boys. It’s when I see all of his friends turning five around him and I take deep sighs of relief because we still have a few more months until he blows out five candles. It’s the preschool graduation that is both ridiculous and heart wrenching when they dress him up in a tiny cap and gown. Deep breaths….don’t let out a sob in front of everyone…..
It’s my boy choosing Batman and a whale and me trying not to marvel at the chubby toddler hands that have morphed into little boy hands. It’s those big hands and huge feet that sort of make him look like a puppy that still has a lot of growing to do. So today, I’m embracing and feeling ALL THE FEELINGS for Batman and a whale and for the very long road ahead of me and for these defective babies that just keep growing. So for today, I’ll let my irrational mommy emotions seep out just a bit. Just for today. Tomorrow I’ll be good. That is unless my daughter decides to grow up on me too. Then all bets are off. I wish I could freeze my kids and make them stop growing up so fast, but I haven’t found the secret yet. Let me know if you find the secret! Please share with me too! Kids grow so fast! Some days I know we wish we could just stunt their growth. Hang in there. We love ocean creatures here, too. Red is actually wearing a crab shirt as we speak! What? You mean the chubby toddler hands don’t stick around forever? No fair. Kids grow up so fast,I still remember having my oldest like it was yesterday.My oldest she loves Dolphins. My kids keep growing, too. I wonder if it’s something in the water? Your son is the cutest, and I loved this post! Cute shirt and shoes. 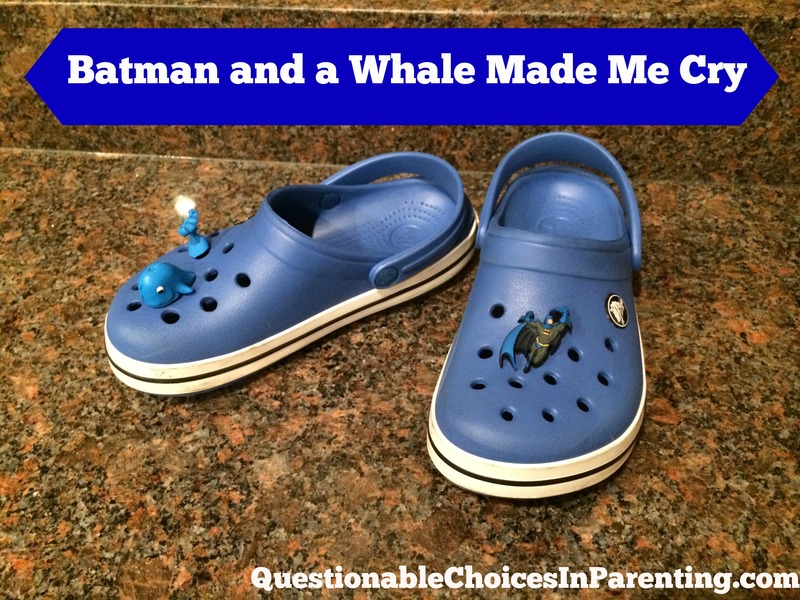 I love the whale for the crocs! So cute! I truly miss when my son was a little guy. We had so much fun together. Hold on to them as long as you can. My nephew is really into sharks too! He will be 7 this month, and I can hardly believe it! My kids turn 9 and 12 this month, it makes me so sad. I can’t believe how quickly they grow and how much sadder I get each year! Boys will be boys. Just feel all the feels now as they are innocent until he starts discovering GIRLS! Enjoy these moments! If you figure out how to slow it down- please let me know! I love the Whale Croc accessory! Keep and treasure that Batman and whale, they will become great mementos full of memories later in the years; kids grow up fast, far faster than I ever expected. There is nothing wrong with irrational mommy emotions- they are normal. I have had them for 6 years now and wonder if they will ever go away. I love how kids stick to a couple things and REALLY love them. This made me all weepy. It’s such a beautifully written expression of something we all feel. Very, very sweet. I know the feeling! Mine had his Kindergarten promotion yesterday and Im like where did the year go? But ill cherish every moment! Oh my goodness, I totally know the feeling; I wish I could just freeze time! It’s crazy how time goes by so freakin fast! Just today, I asked my youngest why he has to keep getting so big. He said it’s because that’s what kids do. Sigh. Seriously…can we make them stop growing. My momma heart can’t handle it! You got me. I seem to be crying over everything myself these days. Our kids grow up much too fast. My big boy is grown and on his own now. I am looking forward to spending the weekend with him. I am sure to cry the whole time I am there. Time just flies by, doesn’t it. Sometimes I wish I could freeze time. There are some things that bring me to tears, happy tears but also sad tears. I just want my oldest to be a baby for one more day. I miss them being baby babies. I’ve got a bunch of defective kids too! lol…Just wait til one turns into a teenager. It’s the worst metamorphsis ever, I promise. Most days I wish they would just stay babies! This is a great, great post. The paragraph just below the photo of the t-shirts — I may have sniffled (a lot). My kid isn’t even 2. He doesn’t even wear shoes. Hell, he doesn’t even wear socks. But when he grabs my hand so that he can scoot down the stairs, I’m already wondering when he’ll swatting my hand away and doing it all on his own. Kids grow up way tooo fast! My daughter is 6 and i wish she could stop growing! Those shark shirts are amazing! I need them for my little’s wardrobe! They do seem to grow up so fast! My oldest is getting married in a little over a week. She should still be playing with toy dinosaurs! I completely understand how you are feeling. Aw, my little man is super into sharks these days too. Where did my tiny baby boy go? I love crocs on my kinds and even my teenagers wear em ofc not with their friends but at home. Those accessories are so cute am glad my baby will come soon and we can get some those. I just wrote a whole post on kids growing too fast. I wish there was a pause button. It makes me sad how fast my kids are growing! I remember when my daughter was that age. They grow up so fast! The Batman and The Whale are just two of many more signs of impending adulthood, it all moves way to fast, enjoy every second! Time sure does fly! My oldest is 20 and it seems like yesterday I was kissing booboos and snuggling. It’s crazy. Hahaha, I totally understand! I just want to keep them in a permanent “no-grow” bubble! My son just turned 11. 🙁 And then he told me just 5 months until he can drive. I cried and told him we aren’t going to talk about that! My kids do things every day that bring tears to my eyes. They were finally tall enough to ride the water ride all by themselves. Made me sad an proud all at the same time. Lol. Argh! Mine are defective too! I keep telling them I’m going to put books on their heads to keep them from growing but they just won’t let me. Glad you were able to let the emotions (irrational or not) seep out. I Hate how fast they seem to grwo up. I try to make my daughter a little baby again LOL…she is never amused. I like those designs! And it looks like it’s the same soft vintage kind that I like to buy for my son too. Very nice! I tell my kids all the time that they need to stop growing…that they are perfect just as they are. They do not cooperate lol. It is incredible how fast our children grow up. Yesterday my first born was born today she graduate high school. I loved when my kids had those in their crocs. My son had the disney characters. I miss them being small. Admittedly, I sometimes have a difficult time connecting to blogs where the main subject is the blogger’s child. I can’t relate since I don’t have any children of my own yet. But, your post reeled me in immediately! I loved it! And at least I can feel some of the feelings when I notice how big my friends’ children get every single day. Really, though, your post made me laugh and feel complete sympathy, haha.